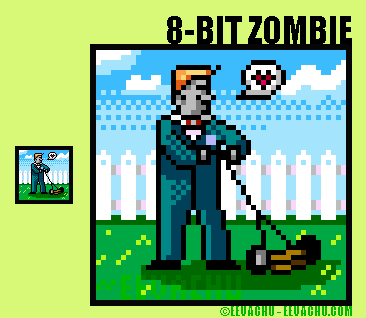 This was a weird prompt, luckily I am familiar with pixel art. Done in the NES palette, so everything is super bright. Featured is Fido, from the film of the same name, which is one of the best zombie parodies ever made. Give it a watch! 2015. Adobe Photoshop CS6; Wacom Cintiq 22HD; Surface Pro 3; Original is 50 x 50 px.